Free of Charge - Everyone is welcome. This free 8 week mindfulness course is based around the Mindfulness Association’s Level 1 Mindfulness Training. It consists of weekly classes, which are typically two hours long. Our mindfulness living courses, held in Galashiels, Hawick and Kelso, will introduce you to the basic principles of mindfulness and support you in developing the core skill of mindfulness: a way of paying attention, on purpose, non-judgmentally to what goes on in the present moment within your body, mind and the world around you. Mindfulness is an natural capacity of the mind which helps you to be aware of the present moment, in a non-judgemental way, instead of worrying about the past or future. It promotes a way of being that helps us to take better care of ourselves and lead healthier lives. It also enables us to access inner resources for coping effectively with stress, difficulty and illness. Please see our events listing for the start date of the next Peer 2 Peer Mindfulness Based Living Course. It is recommended that you attend a Peer 2 Peer Mindfulness Introductory Session before starting an 8 week course. 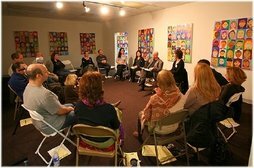 At this session you will receive answers to the questions – What is Mindfulness? and, Why Practice It? - and a lot more. You will also obtain an opportunity to experience mindfulness with some basic practices.